​Chichester Harbour is a haven for watersports, whether sailing, windsurfing or canoeing. It is possible to hire canoes on Chichester canal, motor boats in Itchenor and there are sailing and activity clubs in the area, some of which offer programmes for all ages. ​Chichester harbour has more than 55,000 resident or migratory birds in each year - it is a bird watcher's paradise. Throughout winter there are weekly bird watching boat trips and informative talks organised by the Chichester Harbour Conservancy. A range of trips are available on Solar Heritage, a solar powered boat, including photography, birdwatching, local history and sunset trips. From Emworth you can also be sailed out on an original oyster catching boat, learning about this traditional activity in the area. West Sussex has a fantastic selection of paths and tracks, including pretty coastal walks with sea views and South Downs walks for beautiful, open panoramas. 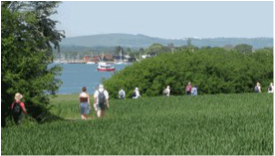 The Chichester Harbour Conservancy offer many guided walks, some with coach travel to return. With the wealth of seascapes the harbour and Sussex has to offer, it is has a vibrant artistic community. Both Emsworth and Chichester have extensive yearly art trails, where local artists showcase their work. There are many art classes and workshops and a pottery studio in Nutbourne where you can enjoy small group courses. Skilled practitioners are on hand if you want to relax and pamper yourself. Sessions can take place in your own lodge or in the Hamblin treatment rooms and include massage, beauty treatments and traditional indian ayurvedic medicine. Please ask if you would like details. At Hamblin Hall there are a wide range of yoga and pilates classes taking place each week, as well as meditations, talks and workshops. Just ask for our programme if you are interested in what's on. This is the Sussex Visitor Attraction of the Year 2015 and is set on a 40 acre site in beautiful surroundings in Singleton, about 20 minutes from the Bosham holiday rentals. There are 50 historic buildings to explore and regular demonstrations of rural life over a nine hundred and fifty year period. There is a cafe and shop onsite too.